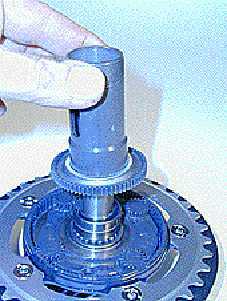 The heart of the speed-drive gearing system is the Triangolo clutch, which is switched by pushing the gear shift button either on the left or on the right side. It is precisely machined out of an extremely strong steel to withstand the harshest conditions. In the centre there is the so called sunwheel. Like planets around the sun, the four planet pinions orbit the sunwheel. 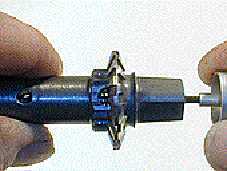 There are two different gear ratios if the axle is coupled either with the internally toothed housing or the planet carrier. 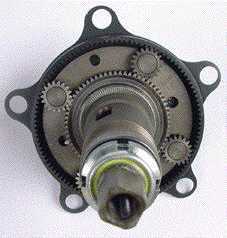 On the photo, you can also see the simple, tough structure of speed-drive. The design allows to strip down the system without any special tools, if ever required. Thanks to the completely enclosed housing, speed-drive is very resistant against dust, water and other environmental influences.